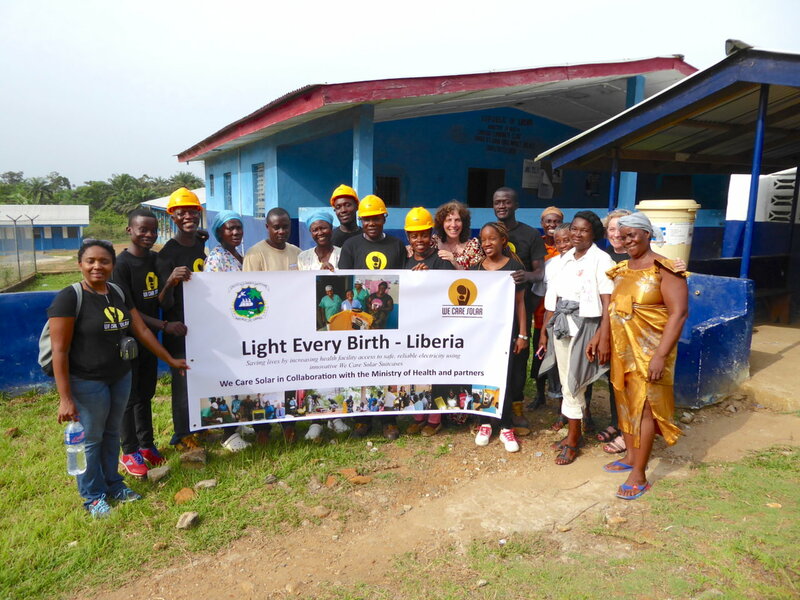 Liberia recently became the first country in the world to pledge to Light Every Birth. The pledge was made at the launch of the Light Every Birth global campaign to support healthy childbirth with affordable, accessible and clean solar lighting and electricity. In honouring its pledge Liberia will strive to equip the country’s 300-plus health facilities with both grid-tied electricity service and high quality, medical-quality off-grid solar systems. We Care Solar will ensure supply of Solar Suitcases to rural communities and medical clinics in which they are needed. They will also provide trainings to local Liberians and held develop their capacity in solar installation, optimal usage and maintenance. We Care Solar’s Solar Ambassador Program promotes women as Solar Suitcase trainers. The We Care Solar Suitcase is described as “An economical, easy-to-use portable power unit that provides health workers with highly efficient medical lighting and power for mobile communication, laptop computers and small medical devices.” Originally designed to support obstetrics medical care the Solar Suitcase is also highly suitable for use in many other medical and humanitarian environments. The basic system includes 40 or 80 watts of solar panels, a 12 amp-hour lithium ferrous phosphate battery, high-efficiency medical task lighting, a universal cellphone charger, a battery charger for AA or AAA batteries and outlets for 12V DC devices. In permanent clinics the yellow case can serve as a cabinet which can be mounted to the wall and the solar panels can be secured to the roof. An expansion kit is also offered by We Care Solar which provides additional lights and a switchbox. Partners for the Light Every Birth initiative in Liberia include Africare, Energising Development, Public Health Initiative Liberia and UNICEF. It is being sponsored by UNDESA, UBS Optimus Foundation, Gilead Foundation and private donors. The Light Every Birth campaign works at the intersection of Sustainable Development Goal (SDG) 7 focused on energy access, SDG 3 which promotes health and SDG 5 which promotes gender equality. The campaign in Liberia will be supported by local leaders, foundations and non-governmental organisations.